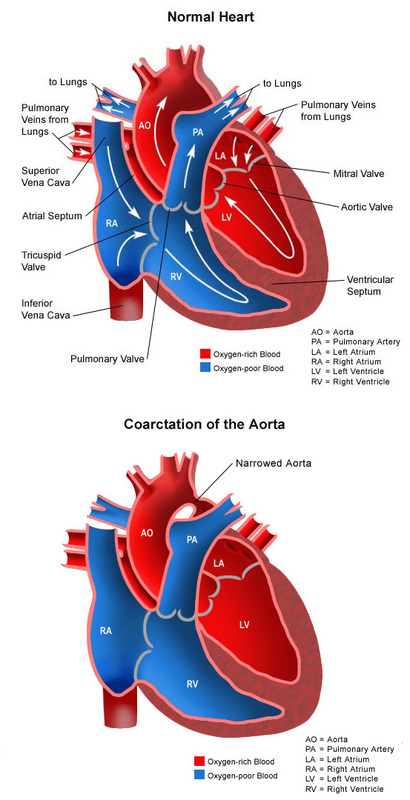 Coarctation of the aorta is a congenital (present at birth) heart defect involving a narrowing of the aorta. The aorta is the large artery that carries oxygen-rich (red) blood from the left ventricle to the body. It is shaped like a candy cane, with the first section moving up towards the head (ascending aorta), then curving in a C-shape as smaller arteries that are attached to it carry blood to the head and arms (aortic arch). After the curve, the aorta becomes straight again, and moves downward towards the abdomen, carrying blood to the lower part of the body (descending aorta). The narrowed segment called coarctation can occur anywhere in the aorta, but is most likely to happen in the segment just after the aortic arch. This narrowing restricts the amount of oxygen-rich (red) blood that can travel to the lower part of the body. Varying degrees of narrowing can occur. The more severe the narrowing, the more symptomatic a child will be, and the earlier the problem will be noticed. In some cases, coarctation is noted in infancy. In others, however, it may not be noted until school-age or adolescence. About one-third of children with coarctation of the aorta also have a bicuspid aortic valve—a valve that has two leaflets instead of the usual three. Coarctation of the aorta occurs in a small percentage of children with congenital heart disease. Boys have the defect twice as often as girls do. Some congenital heart defects may have a genetic link, either occurring due to a defect in a gene, a chromosome abnormality or environmental exposure, causing heart problems to occur more often in certain families. Most of the time this heart defect occurs sporadically (by chance), with no clear reason for its development. Blood pressure is higher before the narrowing, and lower past the narrowing. Older children may have headaches from too much pressure in the vessels in the head, or cramps in the legs or abdomen from too little blood flow in that region. Also, the kidneys may not make enough urine since they require a certain amount of blood flow and a certain blood pressure to perform this task. The walls of the ascending aorta, the aortic arch or any of the arteries in the head and arms may become weakened by high pressure. Spontaneous tears in any of these arteries can occur, which can cause a stroke or uncontrollable bleeding. Blood pressure in the arms significantly greater than the blood pressure in the legs. The symptoms of coarctation of the aorta may resemble other medical conditions or heart problems. Always consult your child’s physician for a diagnosis. Your child’s physician may have heard a heart murmur during a physical examination, and referred your child to a pediatric cardiologist for a diagnosis. A heart murmur is simply a noise caused by the turbulence of blood flowing through the obstruction in the coarctation segment of the aorta. Symptoms your child exhibits will also help with the diagnosis. Chest X-ray. Diagnostic test which uses invisible X-ray energy beams to produce images of internal tissues, bones, and organs onto film. Learn more about X-ray. Electrocardiogram (ECG or EKG). A test that records the electrical activity of the heart, shows abnormal rhythms (arrhythmias) and detects heart muscle damage. Learn more about electrocardiogram. Echocardiogram (echo). A procedure that evaluates the structure and function of the heart by using sound waves recorded on an electronic sensor that produce a moving picture of the heart and heart valves. The vast majority of aortic coarctations are diagnosed by echocardiography. Learn more about echocardiogram. Magnetic resonance imaging (MRI). A diagnostic procedure that uses a combination of large magnets, radiofrequencies and a computer to produce detailed images of organs and structures within the body. Learn more about MRI. Interventional cardiac catheterization. The cardiac catheterization procedure may also be an option for treatment. During the procedure, the child is sedated and a small, thin, flexible tube (catheter) is inserted into a blood vessel in the groin and guided to the inside of the heart. Once the catheter is in the heart, the cardiologist will pass an inflated balloon through the narrowed section of the aorta to stretch the area open. A small device, called a stent, may also be placed in the narrowed area after the balloon dilation to keep the aorta open. Overnight observation in the hospital may be required. Learn more about cardiac catheterization. Surgical repair. Your child’s coarctation of the aorta may be repaired surgically in an operating room. The surgical repair is performed under general anesthesia. The narrowed area is either surgically removed, or made larger with the help of surrounding structures or a patch. Learn more about heart surgery. Some infants will be very sick and require care in the cardiovascular intensive care unit (CVICU) prior to the procedure. Some babies may need urgent repair of the coarctation, while others who are exhibiting few symptoms will have the repair scheduled on a less urgent basis. After surgery or catheterization, infants will return to the CVICU to be closely monitored during recovery. Intravenous (IV) catheters. A small, plastic tube is inserted through the skin into blood vessels to provide IV fluids and important medicines that help your child recover from the operation. Urinary catheter. A small, flexible tube that allows urine to drain out of the bladder and accurately measures how much urine the body makes, which helps determine how well the heart is functioning. After surgery, the heart will be a little weaker than it was before, and the body may start to hold onto fluid, causing swelling and puffiness. Diuretics may be given to help the kidneys remove excess fluid from the body. Chest tube. A drainage tube will be inserted to keep the chest free of blood that would otherwise accumulate after the incision is closed. Bleeding may occur for several hours, or even a few days after surgery. The child may need other equipment not mentioned here to provide support while in the CVICU, or afterward. The hospital staff will explain all of the necessary equipment to you. After catheterization or heart surgery, patients are kept as comfortable as possible with several different medications; some of which relieve pain, and some of which relieve anxiety. The staff will also be asking for the family’s input as to how best to soothe and comfort the child. As your child recovers, you will be taught how to care for the child at home. The child may need to take medications for a while, and these will be explained to you. The staff will provide instructions regarding medications, activity limitations, and follow-up appointments before the child is discharged. What is the long-term outlook after coarctation of the aorta surgical repair? Most children who have had a coarctation of the aorta surgical repair will live healthy lives, and activity levels, appetite and growth should eventually return to normal. The child’s cardiologist may recommend that antibiotics be given to prevent bacterial endocarditis before major surgeries or procedures, such as dental cleaning. As the child grows, the aorta may once again become narrow on occasion, or the repaired area can become weak and dilated (aneurysm). If this happens, a balloon procedure or operation may be necessary to repair the coarctation. A computed tomography (CT scan) or magnetic resonance imaging (MRI) may also be performed to further evaluate the anatomy before deciding on treatment options. Blood pressure management is very important. Often, the blood pressure in the child is elevated after aortic coarctation repair. In that case, medications may be prescribed to help lower the child’s blood pressure. The pediatric cardiologists at CHOC Children’s provide regular follow-up care throughout childhood and into early adulthood.